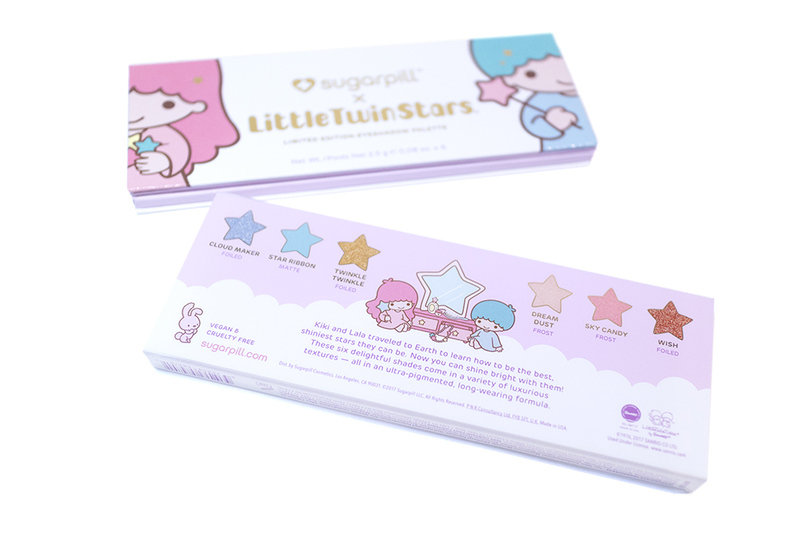 Review: Little Twin Stars Palette (Sugarpill) – Oh My Stellar! I am officially found the cutest eyeshadow palette ever and, since this was limited edition, I’m really glad that I got my hands on this before it disappeared. 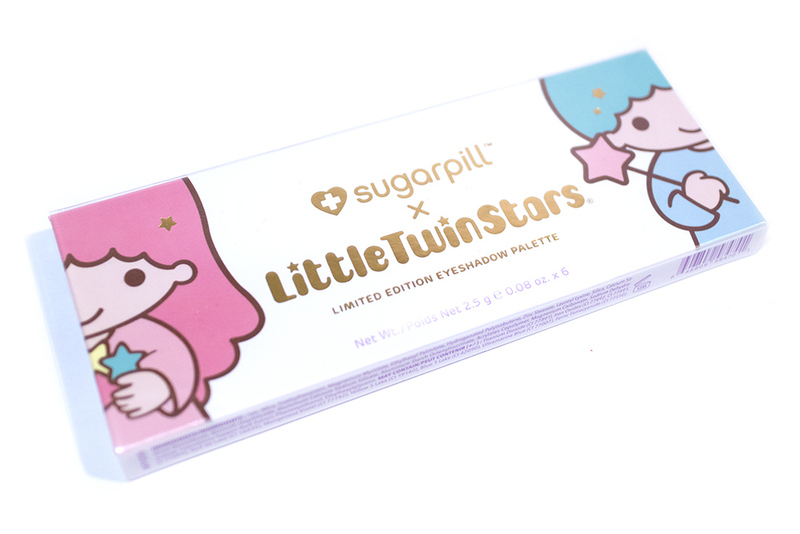 This is the collaboration between Sugarpill andLittle Twins Stars(characters from the Japanese Sanrio company) and the full series also included two matte lipsticks – though I didn’t get those because they sell in a set, and I just can’t see myself using an opaque aqua lipstick ever. Instead, I just ordered the eyeshadow palette, which was what I had my eyes on from the beginning and I was really excited that I got this for half price too! 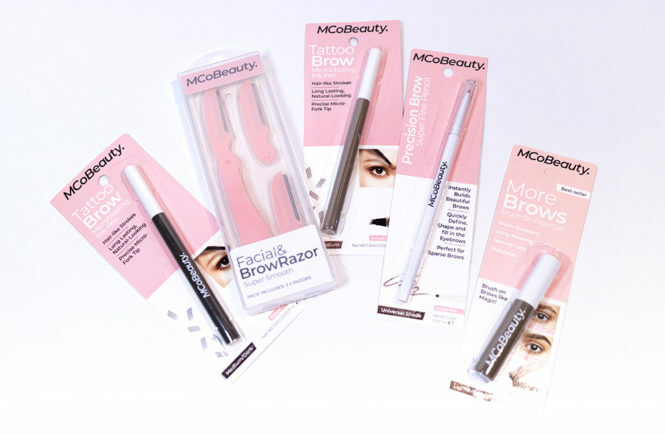 This won’t be available for long, but I got mine off the Black Swallow website – they’re an Australian online retailer (so keep in mind that prices are all in AUD) and they stock a few incredible brands that are difficult to find in Australia; Jeffree Star Cosmetics, Lunar Beauty, Juvia’s Place… just to name a few. They have a good range of different Sugarpill products too, like the lipsticks and single eyeshadows, so I’ll likely be getting a lot more from them in the future! The prices on Black Swallow are pretty good, very comparable to American websites once they are converted, and their customer service is absolutely top notch. In fact, I received this within twelve hours of putting in the order and, even though I live in the same city as their warehouse, that is still incredible. I highly recommend them to so many people and I was also really thankful to be given the opportunity to visit their office and do a live stream with them (which happened after I bought this, so no sponsorship or collaboration here). 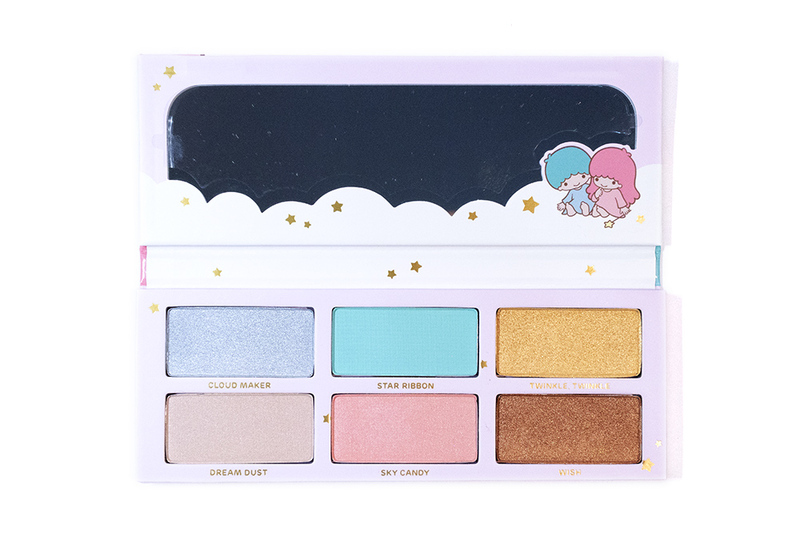 And so, keeping on topic with this Sugarpill x Little Twins Stars palette, let’s go! 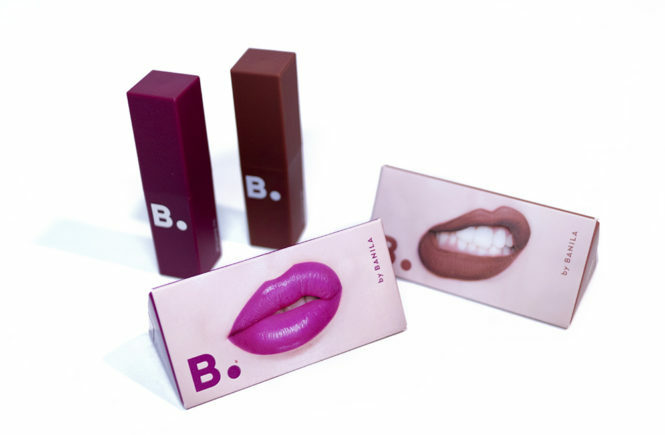 I dreamed of a gender-inclusive makeup line that offered daring shades other brands were afraid to make, in a professional-grade, high-end formula – all wrapped up in the most adorable packaging ever. 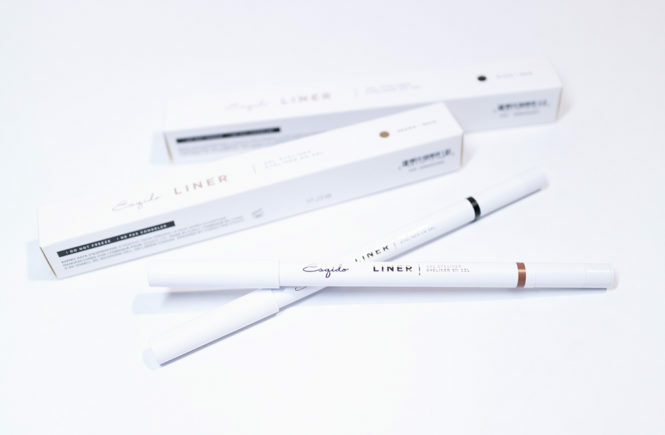 Inspired by the colorful characters in my life, I began to develop my own unique brand of cosmetics for those of us who use makeup as an art form but could not find a brand that understood our unconventional lifestyles. 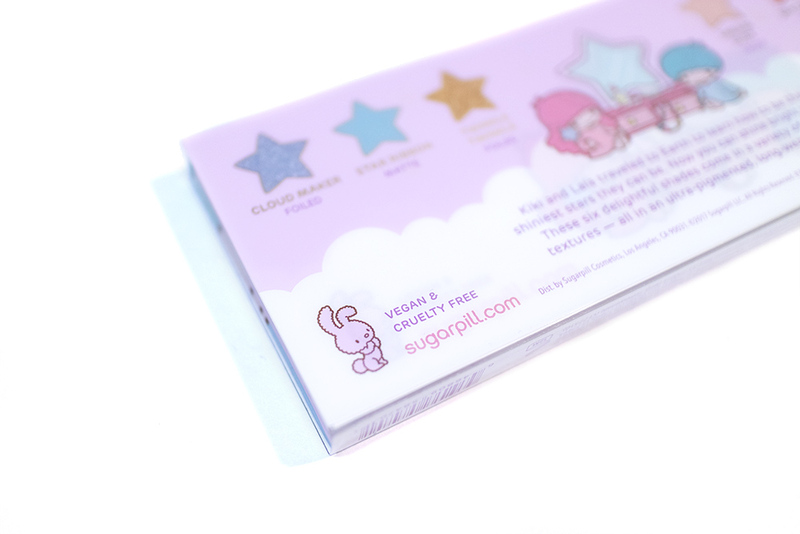 As I previously mentioned, Sugarpill is vegan – and also cruelty free (as you can see from their super cute bunny icon on the back of their package). The brand’s overall aesthetic is very ‘kawaii’, taking inspiration from alternative Japanese fashion, and I feel like they also tread that interesting line between being very cute and also with a dark edge. It’s just really fascinating and their overall image really suits my own style and interests. 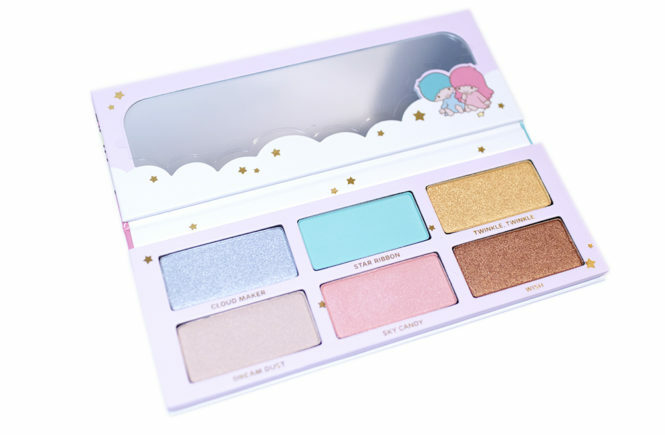 I feel like people who like bright, bold make up will really love Sugarpill products! I’m wanting to try some of their lipsticks next! In summary, this is a six pan eyeshadow palette that can also be used as a cheek palette (which I personally really love doing). The shadows have various formulas: matte, foiled, frosted and shimmer (though I feel like it’s finely milled enough to be similar to the foil) so that you have a lot of variety to work with. 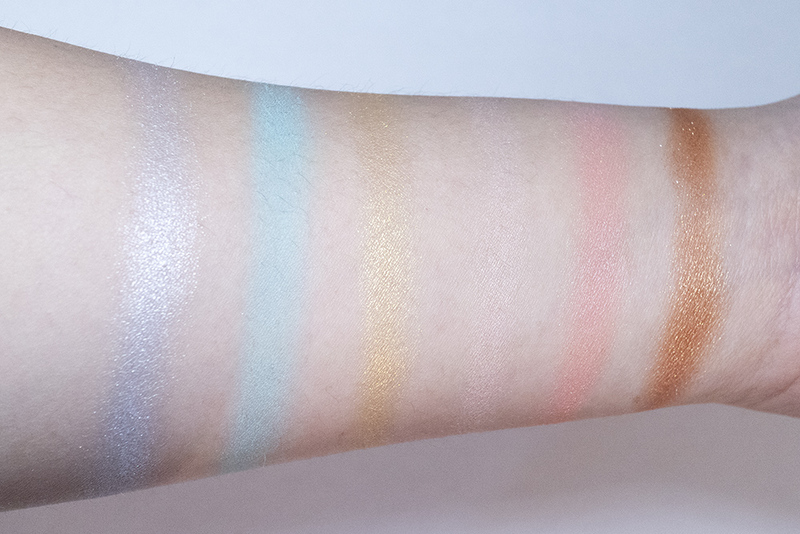 All of these shades are exclusive and they say that they will also not be released individually – as Sugarpill does do a lot of single shadows. 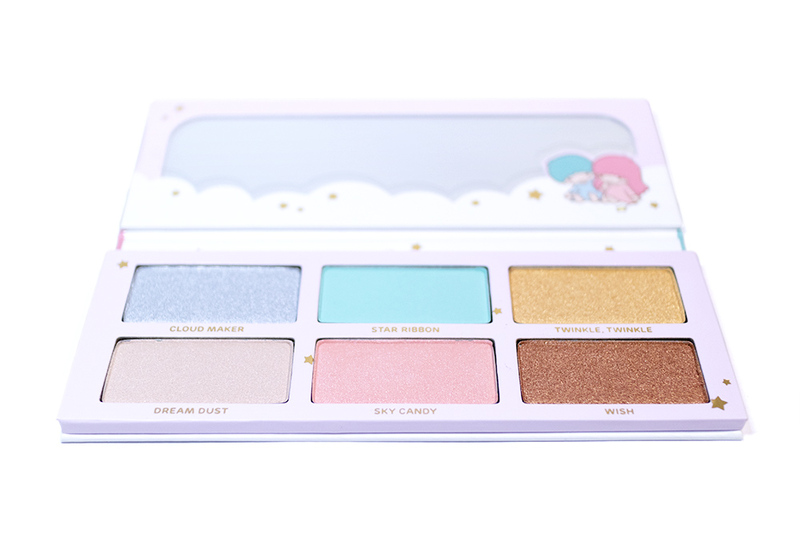 The shades are, of course, all inspired by Little Twin Stars with the use of aqua and blue, peach and baby pinks, as well as the inclusion of two warm gold and copper shades. Although it has a lot of variety, this is what I would consider a companion eyeshadow palette and I struggle to do that many full eye looks using only these shades. So as soon as I opened up this palette, I literally gasped because it was so perfect. I actually attribute part of this to how impeccably Black Swallow had packaged this because even the cardboard palette didn’t have a single crease in it – and I am very pedantic so this sort of thing actually bothers me. Aside from that, I just love the packaging of it – as I would expect since it is a collaboration with Sanrio. Sugarpill is also really well known for their cute aesthetics, so this was only to be expected. 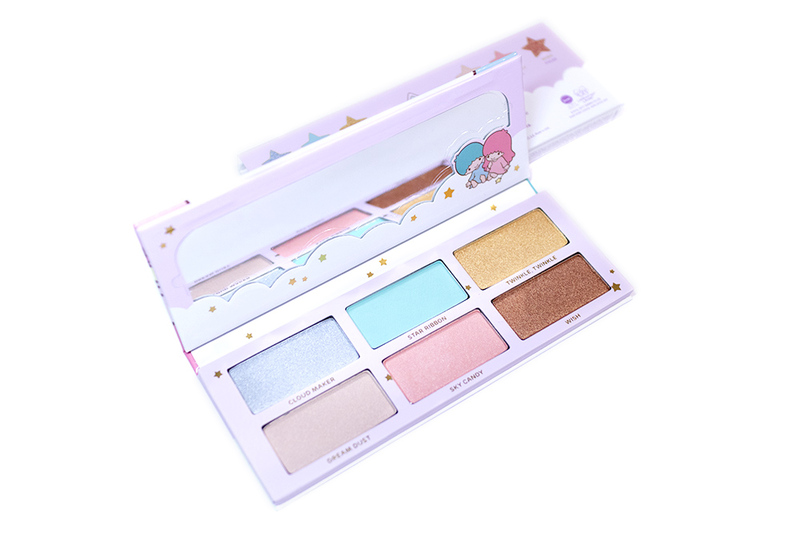 The palette comes in a printed plastic sleeve, which is transparent in the front but has a cute Little Twin Stars print in the back with a story about the characters and the shades. The shade names aren’t printed on the outside of the actual palette, which just had the character illustration. The palette has a magnetic close and is made of cardboard. As I say with all cardboard packaging, I like that it’s light and (probably) a lot more affordable to produce – hence keeping prices down – but I still feel like it isn’t as sturdy as I’d like. I still much prefer plastic cases. Still, the packaging design is really cute! I like the bold illustrations and the gold foil on the front – as well as the little gold stars that are scattered throughout it. Opening it up, there’s a mirror inside. It isn’t full size, as there’s a bit frame around it which makes the space limited. Although I usually prefer full mirrors with no decorative frame, this is so cute (and on brand) that I don’t mind it anyway. The pans inside are really massive and, to be honest, I don’t think that I will ever finish a pan. 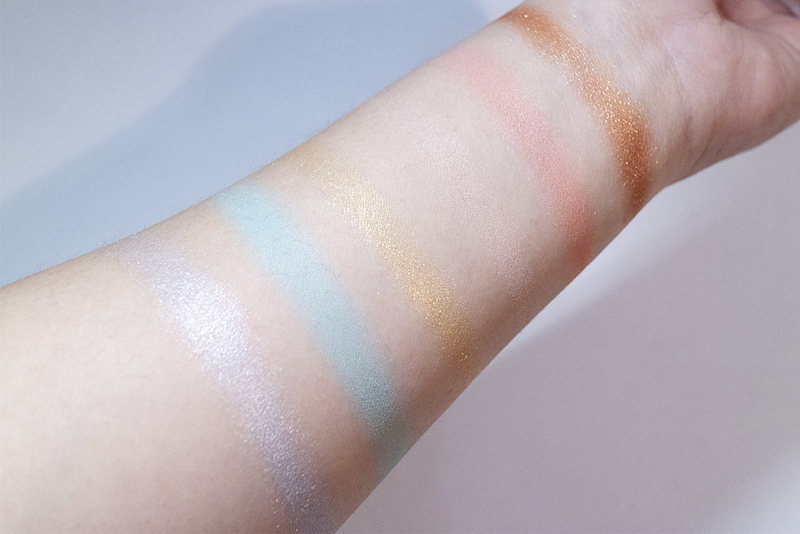 I do get that it is because some shades (dream dust and sky candy in particular) are meant to be multi-use (i.e. you can also use it as a cheek blush or highlight) but I would prefer if the other four shades were halved in size so that we could have more shades. Overall, the packaging is really cute! The functionality of it is quite average – with nothing to complain about aside from wanting smaller pans and a wider shade range. Still, I think that they’ve done a really great job with branding this Little Twin Stars collaboration. 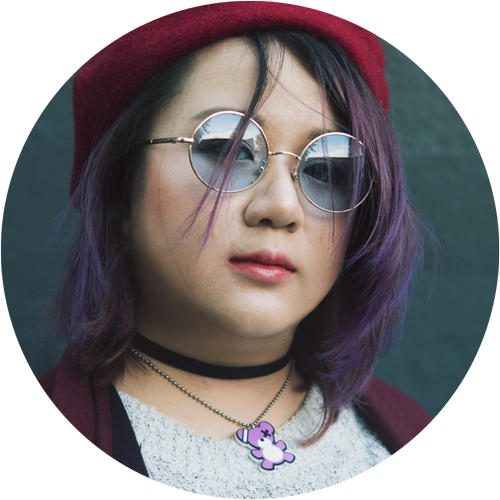 It’s so on point for both Sanrio and Sugarpill! Foiled – these have a very intense metallic formula (which you can see below). In fact, they are even more intense in real life than in the photos. The product picks up well with a packing brush and applies well even without a glitter glue. However, I do recommend to use a primer if you have watery eyes like me, as the foiled formula can crease. Matte – There’s only one matte shade in this palette (star ribbon) and, to be honest, I’m a little disappointed by it. 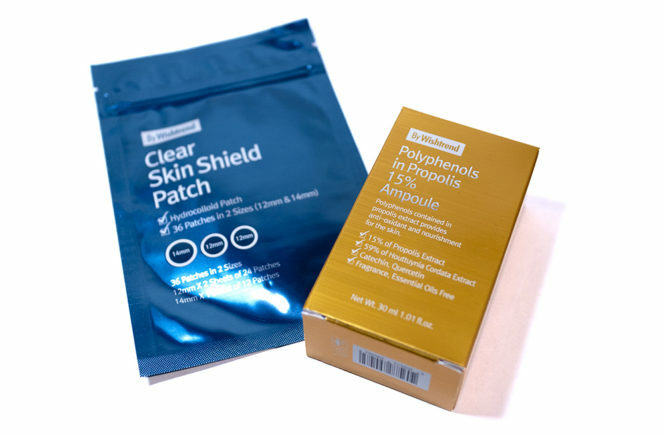 It can be built up to good intensity, but it is very sheer on first application. It actually takes some work to pick up the product and build it – though it does blend out easily. Given Sugarpill‘s reputation, I had expected more from this. Frosted – These were the ones that, at first, I thought were very similar to the foiled but I can see the differences. In comparison, they are a lot more toned down – more like the shimmer, while the foiled are like a metallic. This was a great formula choice for these two shades as they make it easy to use as a cheek product. The pink (sky candy) is a bit more pigmented than the matte shade and doesn’t take as much work building it up. The beige (dream dust) is quite subtle though – as you can see below. It’s a nice natural highlight but, personally, I would prefer if it were more intense like the foil formula. Overall, I don’t regret this purchase at all – and I loved the service that I got with Black Swallow so I’ll be continuing to buy from them. Even as just a collector’s piece, I am really happy that I bought this! It’s unfortunate that the matte formula in this palette didn’t impress me, but I would be interested to try some of the other Sugarpill matte shades. I have a feeling that they sheered out this colour so that it can be more wearable for those who only wanted a wash of colour but, personally, I’m too lazy to build it up so much. I heard that their individual shades are amazing, so I wonder if they’re better. 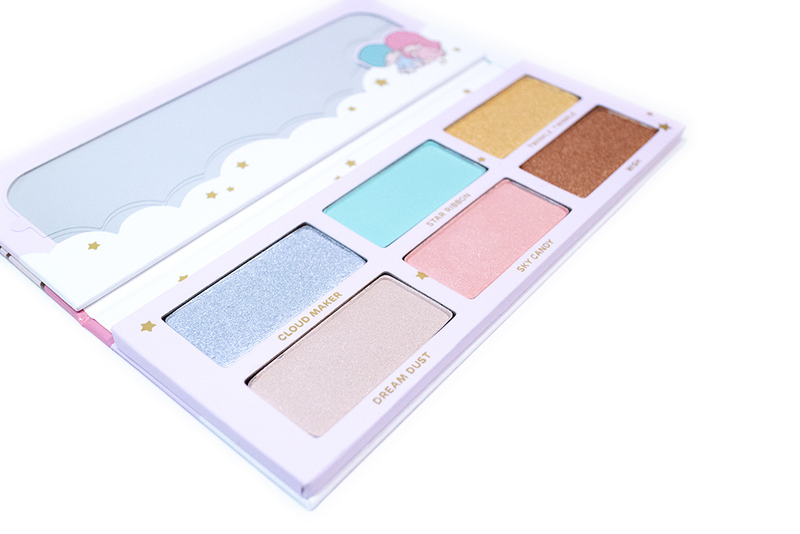 I do hope that Sugarpill releases more palettes in the future, especially if they are going to be this cute! I’m not a fan of buying individual shades, hence why I haven’t purchased any yet. 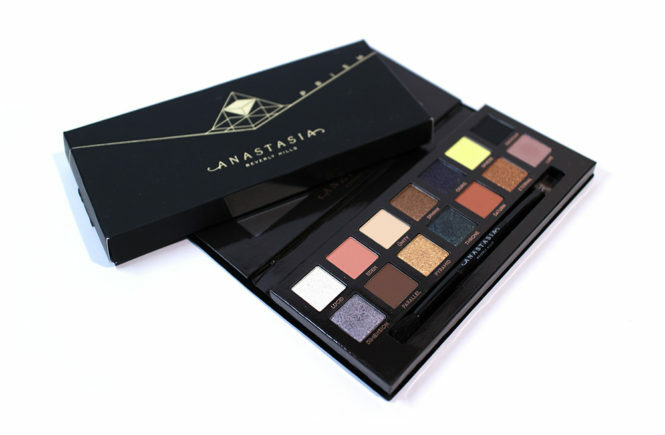 Another thing that I want to note about this palette is that, while it is handy that some of these shades can be used on cheek, the limitations of having only 6 shades here (and with most of them being quite colourful and bold) is that it can be difficult to do varying eye looks using this palette alone. Personally, I prefer to use this in conjunction with others; in this set, I am missing most dimensional shades, but almost all of these can be used as a ‘point’ colour. Longevity wise, these wore fine on my eyes. I only had some creasing in my inner corner with the foil formula if I don’t wear primer, and this is mainly because my eyes are very watery. Otherwise, it would be fine. Although they blend out fine without a primer, I would always use it because of that. And so, here’s the verdict! If this is a palette that has caught you eye, then I would highly recommend to get it now before it disappears! Even though this won’t be something that I reach for every day, it’s still a great addition to my collection and I love it so much. People who love soft, cute make up styles or who are Sanrio fans (like myself) would really adore this! I got this at Black Swallow when they had a sale, but it is unfortunately not stocked anymore. 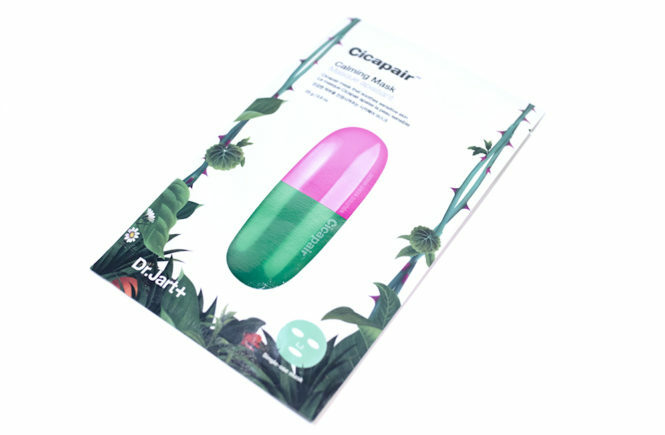 You can still get it on Sugarpill‘s official website though!